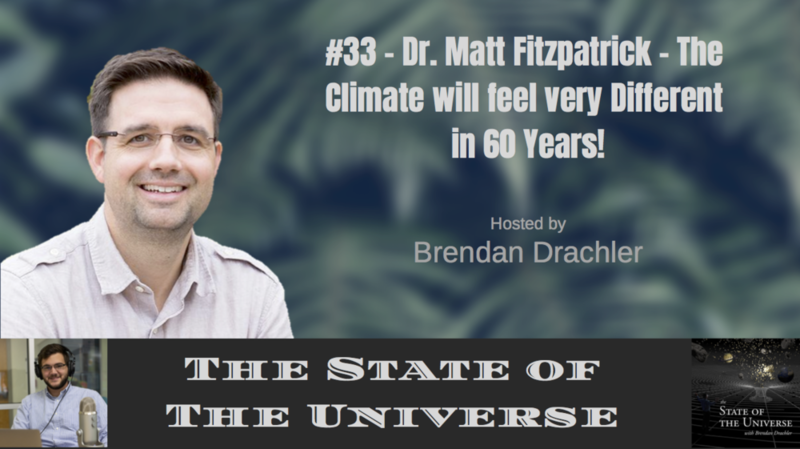 #33 - Dr. Matt Fitzpatrick - The Climate will feel very Different in 60 Years! — Welcome to The State of The Universe! #33 - Dr. Matt Fitzpatrick - The Climate will feel very Different in 60 Years! This week Brendan sits down with Dr. Matt Fitzpatrick to discuss climate change, mapping climate analogs, communicating climate science, feeling discouraged due to climate change denialism, and more! Dr. Matt Fitzpatrick is an Associate Professor and Ecologist at the University of Maryland Center for Environmental Science working in the Appalachian Laboratory. If you want to learn more about him and his work go to http://mfitzpatrick.al.umces.edu/ or follow him on Twitter @MCFitzpatrick. Older Post#32 - Where could we find Life Beyond Earth?